Physical characteristics: Adult male body length is about 4.7 inches (12 centimeters) without the tail, which adds another 4.7 inches (12 centimeters). 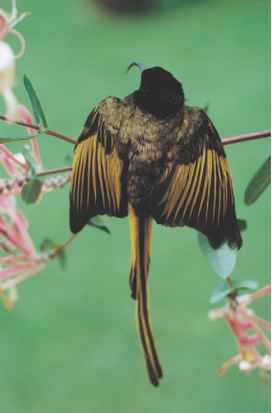 The tail and wings are bright yellow, the shoulders are dark gray, the dark gray extending to the nape and throat, while the head and downturned beak are lighter gray. The tail is long and ends in two long, very narrow parallel feathers. Geographic range: These birds are found in East Africa; Kenya, Tanzania, and Uganda. Habitat: Golden-winged sunbirds live in grassland, bamboo thickets, and tropical mountain forest. Diet: These sunbirds eat mainly nectar, with some insect fare. Behavior and reproduction: Golden-winged sunbirds are of special interest to ethologists (scientists who study animal behavior) because a typical foraging flock of related individuals guards its major source of nectar outside the breeding season, when nectar is their main food source. They actively chase other birds, including others of their own species, away from the nectar source, usually a patch of shrubbery or other plants bearing flowers and nectar. The effect is to increase the amount of nectar available in a flower patch by letting it collect throughout the day, undisturbed by other nectivores (animals that feed on nectar). The more nectar per flower, the less foraging time the sunbirds have to spend on sipping enough for their needs. In addition, the sunbirds wait for nectar in a flower patch to accumulate to a level adequate for feeding the group before making the sipping rounds. Breeding follows the usual pattern among sun-birds: monogamous breeding pairs, purse-like nests, female incubating eggs, and both parents caring for the chicks. Golden-winged sunbirds and people: There is little if any interaction between golden-winged sunbirds and humans. They are valuable to science for their resource-defending behavior, the study of which promises more understanding of avian biology and behavior. Cheke, Robert A., Clive E. Mann, and Richard Allen. A Guide to the Sunbirds, Flowerpeckers, Spiderhunters, and Sugarbirds of the World. New Haven, CT: Yale University Press, 2001. Christy, P., and W. V. Clarke. Guide des Oiseaux de Säo Tomé & Principe. Libreville, Gabon: Ecofac, 1998. Sinclair, Ian, et al. 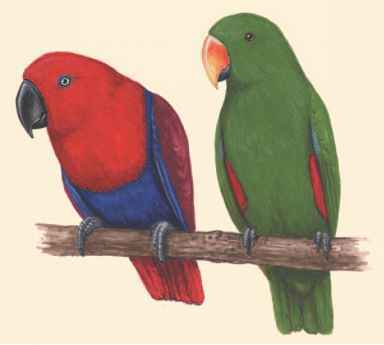 Illustrated Guide to the Birds of Southern Africa. Princeton, NJ: Princeton University Press, 1995. Stevenson, Terry. Field Guide to the Birds of East Africa: Kenya, Tanzania, Uganda, Rwanda, Burundi. Princeton, NJ: Princeton University Press, 2001. Van Perlo, Ber. Birds of Western & Central Africa. Princeton, NJ: Princeton University Press, 2003. Gill, F. B., and L. L. Wolf. "Economics of Feeding Territoriality in the Golden-winged Sunbird." Ecology 56 (1975): 333-345. Irwin, M. P. S. "The Genus Nectarinia and the Evolution and Diversification of Sunbirds: An Afrotropical Perspective." Honeyguide 45, no. 1 (1999): 45-58. Irwin, M. P. S. "What Sunbirds Belong to the Genus Anthreptes?" Honeyguide 39, no. 4 (1993): 211-215. Kennedy, R. S., P. C. Gonzales, and H. C. Miranda. "New Aethopyga Sunbirds (Aves: Nectariniidae) From the Island of Mindanao, Philippines." Auk 114 (1997): 1-10. Pyke, G. H. "The Economics of Territory Size and Time Budget in the Golden-winged Sunbird." American Naturalist 114 (1979): 131-145. Showler, D. A., and P. Davidson. "The Socotra Sunbird Nectarinia balfouri." Sandgrouse 17 (1996): 148-150. Sugarbirds, Flowerpeckers, Sunbirds and Spiderhunters of the World (photo gallery). http://www.camacdonald.com/birding/Sampler7_ SunbirdsFlowerpeckers.htm (accessed on July 20, 2004).